Looking for a 100% chemical and pesticide free Australian Manuka Honey? With AB’s Australian Manuka Honey, you’ve finally struck liquid gold. We’re proud to say we believe it is the best Manuka Honey in Australia. Created by bees collecting nectar and pollen from native Australian flora, AB’s Manuka Honey is natural, unique and delicious and 100% Australian honey, sourced from Australian native forests. Now available to buy online through Simply Honey and delivered right to your door, AB’s Manuka Honey is a premium product. Now we know our loyal fans of AB’s Manuka Honey love the exceptional taste, but we also know that many customers purchase Manuka Honey as it has long been believed and used to help with a variety of different alignments such as healing wounds, soothing sore throats and with digestive problems. We are not doctors, we simply know the quality of AB’s Honey products and our Manuka Honey is the bee’s knees with a rich and distinctive earthy taste, coupled with its deep rich dark colour. Don’t just take our word for it, try it and you will see why AB’s Manuka Honey is not only extremely popular in Australia but is in strong demand worldwide. AB’s real raw Manuka Honey is available in four strengths* with 900+ methylglyoxal being the highest. Other strengths are 500+mgo, 100+mgo and 30+mgo. 375g comes in a glass jar and will have its lid taped for safe transportation. 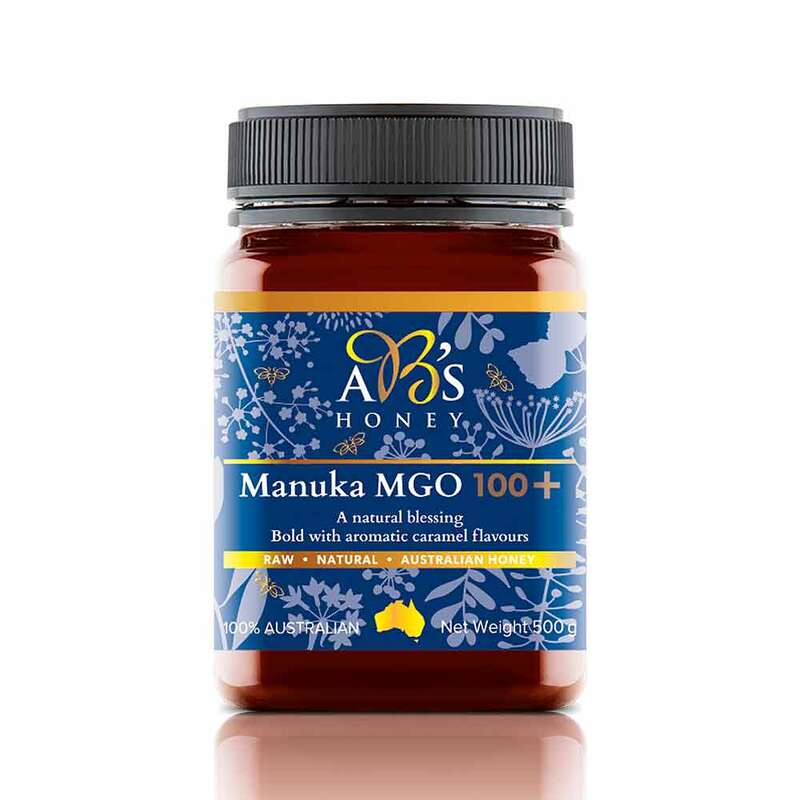 *The active strength of all Manuka is based on levels of MGO (methylglyoxal) per kilogram. For example, AB’s Manuka Honey 900+ is scientifically tested for MGO (methylglyoxal) with a content of 900+ per kilo. *Manuka Honey is often thought to be a product of New Zealand, however, Australia has its own native varieties of Manuka plants from the same genus: Leptospermum – over 80 in fact! Our beekeepers harvest nectar from Australian Manuka plants (locally known as ‘Jelly Bush‘ and thus why some refer to it as Jelly Bush Honey) so we can enjoy locally produced Australian Manuka Honey. There’s no doubt this honey reflects the quality and purity you’d expect from the AB’s Honey premium natural brand. Where to Buy Manuka Honey? AB’s Manuka honey is only available for sale from this online honey shop or from Jan Powers Farmers Markets.